Kelly and I made a tomato-lentil soup (not good enough to write about, but not bad), and the original plan was for her to have a grilled cheese with hers, and I was going to have crackers. 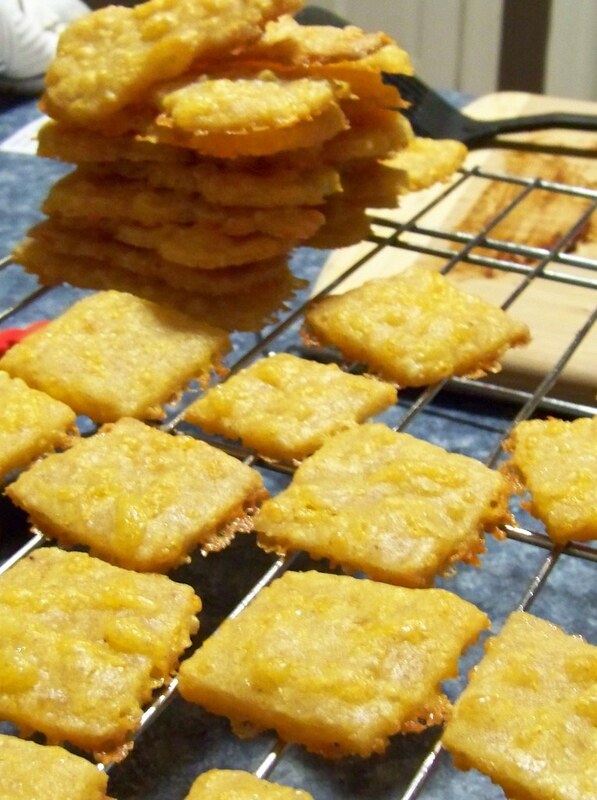 I've made Cheese-it type crackers before, but I don't remember what recipe I used. So I made a gluten-free version of these. Mine don't look as beautiful when they're done, I might have put too much cheese in them so it comes out a bit when they bake, but mmm they are delicious. Next time I make them I would shred the cheese with the smaller setting on the grater. I made snowman shapes with the first batch, then the rest were squares because it was getting late and we still had to get dressed to go out. They taste good either way. Preheat oven to 350. Mix (in the food processor) flour, salt, xanthan gum, paprika, and chili powder. Add some pepper if you want. Pulse in the butter until crumbly, then add the cheese. Break in the egg and pulse until combined, then open the food processor and pinch the dough. If it holds together a little, dump into a bowl and knead with your hands until it holds together. If its too sticky, add a little flour, if too dry, add water a tablespoon at a time until it feels like it won't be all sticky when you roll it out. Once the dough is all kneaded and nice, split it in half and wrap each piece in plastic wrap. Stick in the fridge for at least half an hour. Once it's chilled, roll out between two pieces of floured wax paper. 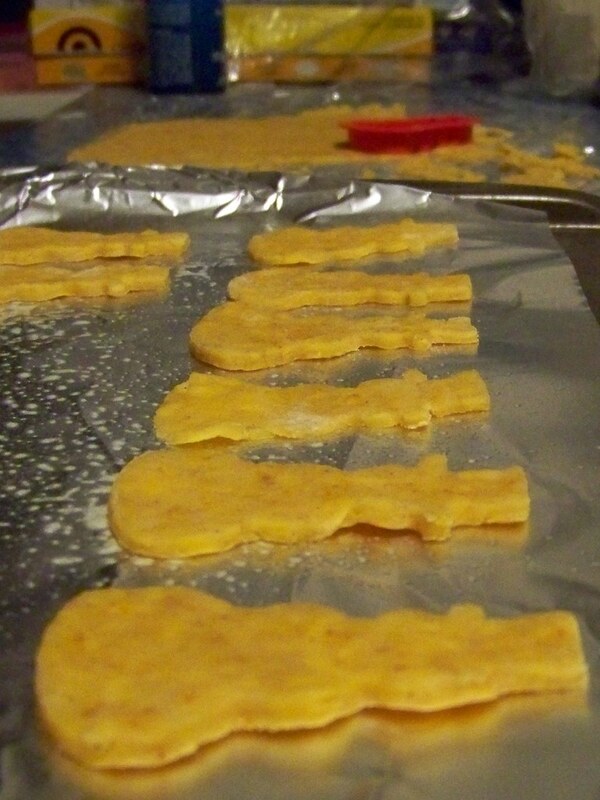 Cut into squares or snowmen, and bake 15-20 minutes until browned and slightly crispy. I can't wait to try this recipe! Allie from Sorry I can't eat that had the great idea to print out recipes from blogs you want to try. I need to start! These sound awesome and so easy! I never seem to have gluten free crackers around for soup. 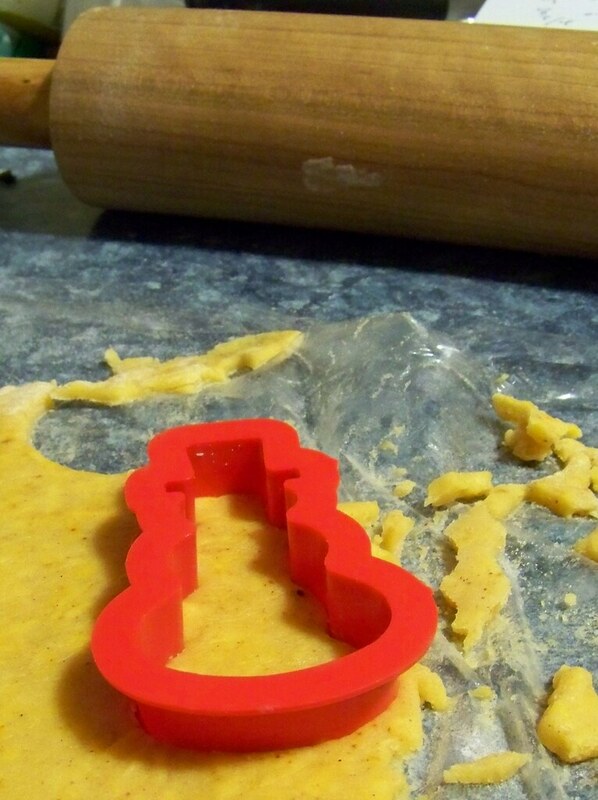 I'll definitely have to make a batch of these. These remind me of the Pao de Queijo I make, except I use tapioca flour and no butter. I like to make disks, which I cut into little triangles (like cutting a pizza pie..actually, I use my recipe as pizza dough too). I appreciate your idea of adding paprika and chili powder--I'll try that next time!